The Ocean Pro Enzo Snorkel features an Internal Diameter designed for Optimum Flow Rate and is perfect for Free Diving and Spear Fishing. The Tried and True J"- Style Snorkel design with a Low Profile Contoured Tube for Snag Free and Low Drag around Rocks and Reefs when your On-the-Hunt" looking for that Trophy Fish or just Running-Silent on a Free Dive. Snorkel has a Regular Top, No Valves that can Leak and a Soft and Comfortable Mouthpiece for hours of Snorkeling Fun. 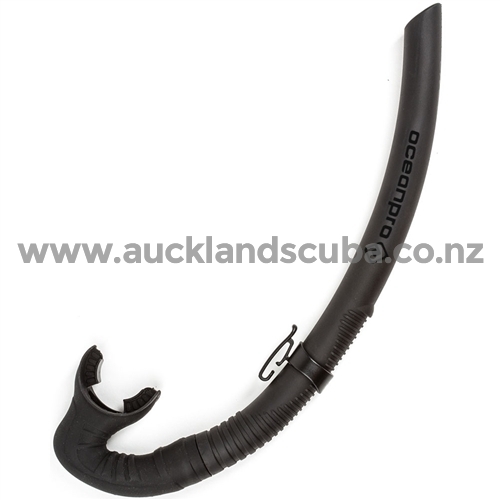 Snorkel has a Simple, yet Efficient Snorkel Keeper for attachment to Mask and comes in All Black for that stealthy look. Great Around Rock & Reef while "On-the-Hunt"